The Target Practice Project is an international collage collaboration that I started not long after my father died in June of 2013. I didn't know when I started it that art would heal...but art has helped to heal. At last count the Project had over 750 participants from six continents. Well over 1,500 collages, assemblages, photographs, and, yes, even videos, were made using the same simple core target image. While other kids were out doing social pre-teen things, I was being dragged around an archery trail or instructed how to man a fishing rod stuffed into a sand spike. Such is the life of a daughter of a sportsman. Of course there were other things I would much rather have been doing, but those things didn't matter and certainly nobody ever asked me about them. And I had learned at a much younger age not even to bring them up. This is because a parent afflicted with narcissism doesn't mirror back the child to the child as is desirable and normal, so what the child wants or needs simply doesn't matter. 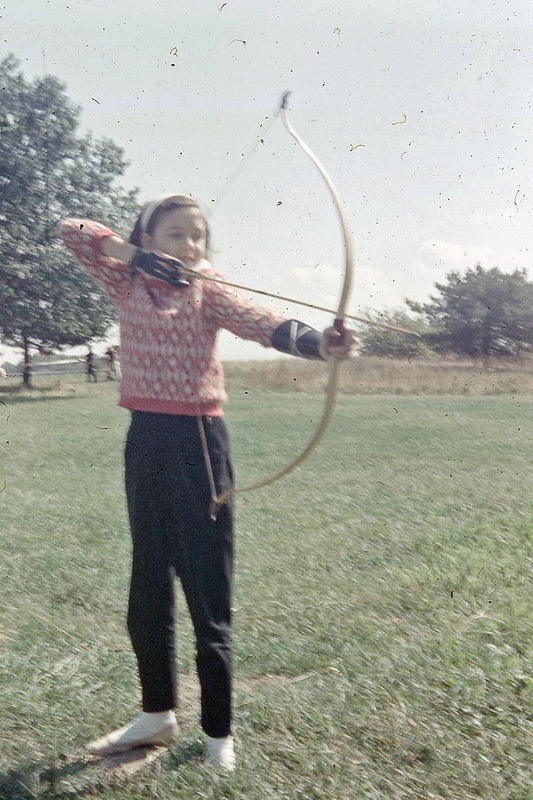 No, to a narcissistic parent, the child IS the mirror, reflecting back the parent's own issues and interests, in this case, bows and arrows, guns, fishing and camping gear, and boats. My father left behind all this stuff when he passed away, at 90, in June of 2013, but it was the tall stack of 1960s archery targets from Sears Roebuck, hidden behind some ancient fish coolers in the garage, that got my attention. As a collagist, I am always on the lookout for old paper with interesting patterns. Still, I didn't grab the targets right away. Instead, over the next several weeks I entered into a polite hands-off relationship with them, where I would nod in their direction as I entered and exited my father's house to perform my clean-out chores. Under self-scrutiny, I see that my relationship to the targets is not unlike the adult relationship I had with my father, especially in respect to my artwork, which he never once asked to see or even noticed on the walls of my home. Just as my pre-teen essence was irrelevant to my father, so was my adult essence. My father died without ever acknowledging even a single product of my heart, spirit, or hand. 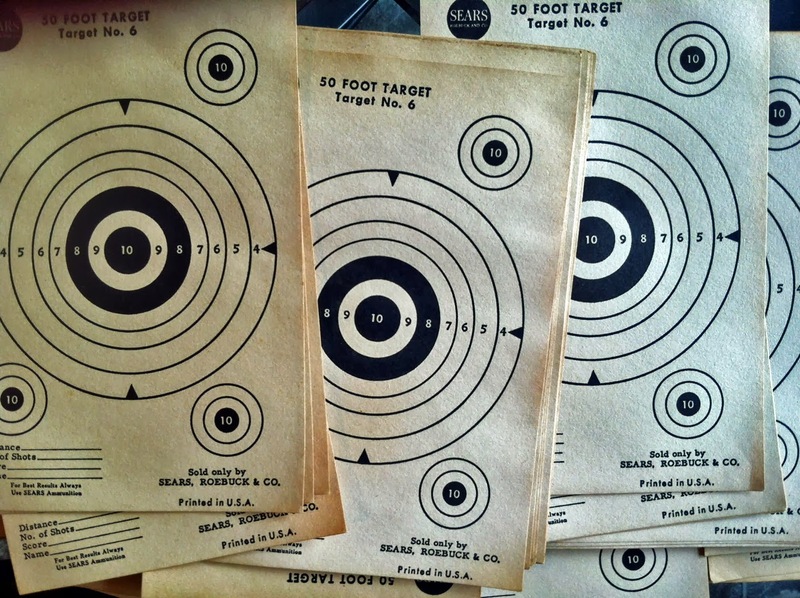 Archery targets, vintage 1960s, from Sears, Roebuck & Co. But now I had these targets, and something grand in me wanted to make the two divergent threads—one of my artwork, one of my father—intertwine. You could say that I saw redemption in the crosshairs. Time was offering me an opportunity to create a congruence that had not existed in my life, and so I pulled back the metaphorical bow string and shot the arrow. About a month after my father died, I snapped some photos of the pile of targets, posted them on Facebook, and put out a call to my artist friends both here in the States and internationally. Who wanted to collage some targets? I started a group on Facebook, called “Target Practice,” where people could post their work. Within a few days I had mailed out almost 150 targets. Immediately, work began to roll back in. The response was unanticipated, and stunning, a testament to the power of community and hope. It is very exciting ! Very! I am stunned and humbled by the response of artists around the world. What a great finale after enduring all of those years of psychological neglect from your narcissistic father. But I have to ask, do you like to hunt, fish, camp, or go boating now that you have been freed from your parental chains? Do you ever go out into the field and shoot some arrows just for the fun of it, or at least feel a want to do so? I also had a very narcissistic father who forced his interests (or lack of interest) upon me and negatively criticized everything I did that didn't fall into his scope of interests. When he died I felt like I had shed a pair of concrete shoes and share none of the interests he had forcibly exposed me to. His passing actually came as a relief. I didn't come across anything of interest to me while sifting through his belongings other than a pair of good binoculars and felt let down by that. I always felt he had had some sort of interest in life I had never been exposed to. Alas there was none, and it became apparent that he was never even remotely interested in me. No pictures or anything remotely resembling any sort of trivia about my life. There was quite a lot there about my brother which I sent to him. How important it was I haven't a clue. I think you are lucky to have found things to remind you of your childhood and the experiences you shared with your father, good or bad. It seems the bad wasn't really that bad. Or, put in another way, it could have been worse. Sharing those targets with interested artists around the country and around the world is akin sharing your childhood with people of mutual interests. Sharing your story in a way. I sort of envy you. Finding those targets, in a way, had to be like rediscovering your childhood through things that had been important to your father that he felt a need to share with you. Thanks for your blog...it awakened something long dormant in my psyche. My father didn't so much share as march me through his paces, and, as soon as I was able, I fled the artifacts of his world in a search for ones that had meaning to me. Which is a long haul...that search...when you've not had any acknowledgment that you even HAVE interests or exist as a personality, however nascent. I'm sure you know about that, having a similar background. In much the same way, reaching out with my father's targets to artists around the world is not so much about sharing my story as rewriting it. It's about finally being heard, about breaking through suppression. It's like taking a few hundred lumps of coal, sending them through the universe, and having them reappear as sparkling multi-faceted diamonds. It's an act of global goodness. I don't think of any of this in a vengeful fashion, I hasten to add, more along the lines of reclaiming, at long last, that which had been, as a child and young adult, stolen from me. Your comments are greatly appreciated, and I'm glad for the opportunity to articulate. That I could speak to your psyche...well, that's precious. Thank you for letting me know. Easy. If you would like a couple of the paper targets, email me your mailing address at laura.holmes@yahoo.com and I will send them out. If you prefer digital work, grab the target download under the "want a target" tab. We have a facebook group at https://www.facebook.com/groups/161991817319872/. If you're on Facebook, you can ask to join the group there and see what everybody else is doing.